SD Elements can be made aware of the various statuses your Application Lifecycle Management (ALM) tools use for task completion. This is possible by mapping statuses you have set up in your ALM to the statuses that SD Elements uses, and vice-versa. Once you create these mappings and sync your ALM to SD Elements (or vice-versa), SD Elements will better reflect the different states of your ALM’s workflow in task lists and reports. For example, if you use a status called “Done” in your ALM, you can map it to the SD Elements status of &apos;Complete&apos;. SD Elements determines these mappings based on the inherent meanings of statuses. For instance, the status &apos;Complete&apos; in SD Elements has a meaning of &apos;Done&apos;. If you map the status &apos;ALM-Finished&apos; from your ALM to the status &apos;SDE-Complete&apos; in SD Elements, then SD Elements will assign &apos;ALM-Finished&apos; the meaning of &apos;Done&apos;. The following table shows how the name of a status in SD Elements has inherent meanings. You can define which statuses in SD Elements are directly mapped to statuses in an ALM. In other words, you can define your ALM statuses against the default SD Elements status meanings of &apos;Done&apos; (Complete), &apos;To Do&apos; (Incomplete), and &apos;NA&apos; (Not Applicable). Map a JIRA status to an SD Elements status: The direct mapping between your ALM to SD Elements. 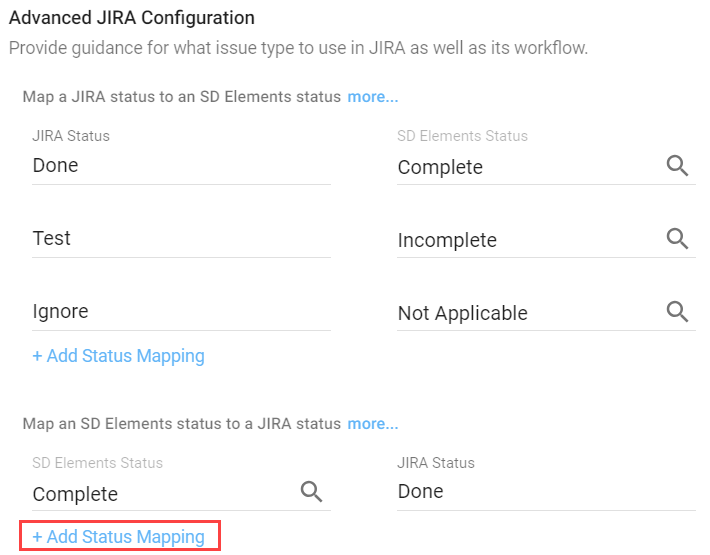 Map an SD Elements status to a JIRA status: The direct mapping between SD Elements to your ALM. Closed Issue Status: The status that is assigned to a task that becomes closed if it falls out of scope of your project. For example, when the project survey is changed and a task is no longer relevant to the project, it will be assigned this status. System connectors created in versions of SD Elements prior to 4.19 are considered legacy system connectors. Syncs using these connectors will continue to work as before, but any updates to them will also require updating their status mappings as though they were a new system connector. Project connections that use legacy system connectors can continue to be edited. While these project connections will continue to sync, update legacy system connectors for greater control of sync behavior. Map an ALM status to all required meanings in SD Elements before adding any new mappings. The statuses for these meanings are: &apos;Incomplete&apos;, &apos;Complete&apos;, and &apos;Not Applicable&apos;. This one-to-one mapping allows SD Elements to establish a meaning between the statuses in the ALM and the statuses in SD Elements. Once these three statuses have been mapped, you can add more using the same instructions. The user has the permission Project role→Integration→Edit ALM connections. The user is familiar with the statuses of their ALM. Add a new ALM connector or edit an existing one. See Add/Edit an ALM connector for more information. Once the connection is created or you are ready to add a mapping, scroll down to Advanced ALM Configuration, where ALM is the ALM you want to configure. Under Map an ALM status to an SD Elements status, click on Add Status Mapping. Click on the ALM Status field and enter the name of the ALM status. Click on the SD Elements Status field to bring up a dropdown menu. Search for a specific custom status or select one from the menu. Ensure that &apos;Incomplete&apos;, &apos;Complete&apos;, or &apos;Not Applicable&apos; have been mapped. Repeat the previous steps until the &apos;Incomplete&apos;, &apos;Complete&apos;, and &apos;Not Applicable&apos; statuses in SD Elements are mapped to statuses in the ALM. The statuses from the ALM are now mapped to those in SD Elements. Any ALM status that is not mapped here will map to an SD Elements status of &apos;Incomplete&apos; and have the meaning of &apos;To Do&apos; by default. This process is not complete. Continue to the next section. Ensure that the &apos;Incomplete&apos;, &apos;Complete&apos;, and &apos;Not Applicable&apos; statuses in SD Elements are mapped to the statuses in the ALM. Under Map an SD Elements status to an ALM status, click on Add Status Mapping. The ALM statuses that you enter here in part 2 must match the ones entered in part 1. Click on Create or Done to complete the mapping. The statuses in SD Elements are now mapped to those from the ALM. SD Elements will use these three mappings by default to treat any unmapped custom statuses. Click on the yellow button called +Add Status. Enter the Slug, Name and Meaning of the status. Optionally, you can check the Default box to make this task status the default status for all tasks. Only one task can be marked as default. Optionally, you can check the Requires comment box for this task to require a comments from the user. The new task status appears in the task status table.